I celebrated a birthday last month by inviting my mother, father and brother to lunch. The “Walters party” (a reference to my father’s first name) as we would identify ourselves when fatigued from having to spell out S-m-e-r-c-o-n-i-s-h, together again, probably for the first time, alone, in decades. Mom and dad reside in the same town but haven’t been together for many years. Thankfully we all get along as evidenced by everyone showing up for lunch. I brought a surprise: a ten question family quiz asking things like: the name of the St. Bernard next door (Gampy), the make of any of our old cars (’66 Chevy Impala, ’73 Monte Carlo or the station wagon of indeterminate age with foam rubber in the back so my brother and I could sleep on long trips) and on what street was our favorite Ocean City weekly rental (17th). But then my brother one-upped me. He had made arrangements with the current owners of what we still call “our house” and they’d graciously agreed to let us come by for a quick tour. So after lunch we all headed over to our house, a three-bedroom, one bath (no shower) Dutch colonial on 1/4th of an acre built in 1928 in Doylestown Borough. My parents paid $15,000 for our house in 1962, the year of my birth. My mom told me that my parents borrowed the down payment from my maternal grandmother, a $500 sum that was always on revolving loan to one of her ten siblings. The previous owners were the Shambergers which was convenient on account of the “S” that was decoratively imbedded in the screen door which we therefore didn’t have to replace. Walking across the porch I still remember painting one summer long ago, other memories flowed. My father worked as a public school guidance counselor and at night ran the adult education program at the Bucks County Prison, then nicknamed the “Pine Street Hotel.” The only way we could afford remodeling was when he hired inmates on work release to do renovations. That’s how a fellow named Coleman Foley re-did our kitchen and "Mr. Clymer" put up paneling in the basement. When I was in eighth grade, a “hippie” named Doug (not an inmate) finally installed a shower. Mom was a secretary turned Realtor. She shared the story of the day she'd stopped at home to use the bathroom and while walking up the stairs, looked out a landing window to see a stranger on our side patio. When she called the police she was asked “how many of them are there”? Turns out there’d been a jailbreak from the Pine Street Hotel and the two fellows on the lam were in our back yard. My brother asked if I wanted to “shummie”, our word for sliding our butts down the hardwood staircase in the living room. I instead proposed a new family photo, so the four of us stood on the stairs, right next to the closet where my mother used to hide her weapon of choice, a yardstick from Al Bouc’s Hardware Store which she wielded when we got out of hand. 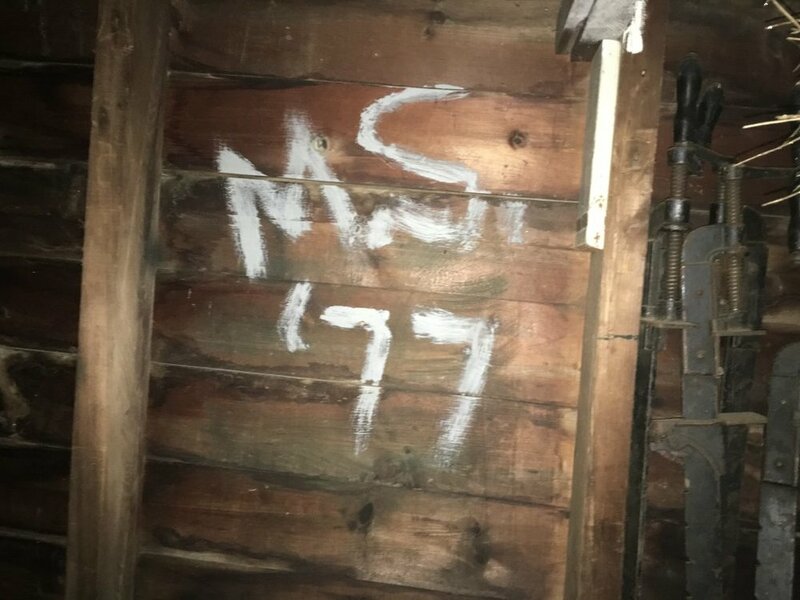 My bedroom held no trace of my existence, but in the detached garage where I used to keep my bike with the banana seat and monkey handle bars, I found my initials as painted on the wall circa 1977. My brother’s room still had a short staircase to the attic but I dared not open the door because I suddenly remembered that’s where the Indians lived at night, the ones who terrorized me as I slept. There is AC in the house now. Quite different from when my brother and I would sleep on my parents bedroom floor on hot summer nights while a window unit hummed to beat the heat. I’d spent my first sixteen years in this home which was separated by about 25’ from the Shutts on one side and the Wrigleys on the other. The Haggertys were two doors down and the MacFarlanes were across the street. Our house number was 24; the Stachels were the reverse: 42. They had go-karts, a pool table and the only in-ground pool on the street, hence we called their place Stachel Valley Country Club. Across the street were the Finns. I vividly recall the day I walked by a Robin’s nest in their back yard only to have the mother leave her nest and peck me on my head. What I can’t recall is whether Mr. Finn settled the score with a shotgun or whether I dreamt that. The only neighbor still on the street is Mrs. Hall - I know because she told me on Facebook. At one end of the street was “the woods”, actually part of Henry Mercer’s Fonthill, where we built tree forts; at the other end was the “junkyard” where farm machinery was warehoused by a local retailer. Next to the junkyard was Hance’s Auto Glass (the Hances lived in an apartment above the shop) and across the street from Hance’s was Kline Pontiac (the Klines likewise lived upstairs) Through a small field behind the Klines was where Mr. Redfield both fixed law mowers and displayed caged raccoons you best not pet, as evidenced by those of his fingers that were missing. Today I can remember both the interior layout of most of the houses on our street because I was in them so often, as well as what each of the dads did for living. They were teachers (and coaches), a liquor store manager, piano teacher, constable, towing service operator (who doubled as the town fire chief), mechanic, postman, and one worked at the Johnsville Naval Air Station, although we never quite knew what that meant. South Philly native David Brenner once joked that when he went out to my current neighborhood, the Main Line, he was surprised to see that every other house was missing. My visit to our house reminded me that’s not all that’s absent. So too the sort of memories that were re-kindled by our going home. The kind that exist only when living in close proximity to others. My kids don’t have neighborhood stories like those that I cherish. That’s the steep price they have paid for acreage and comfort and only time will tell whether it was worth it. The good news is that you can go home again, if only for 15 minutes.